The class Amphibia includes frogs, toads, salamanders and the worm like caecilians. The origin of the term Amphibia comes from Latin meaning 'two lives' (land and water based), as most amphibians spend a larval stage as aquatic water breathers. Amphibians inhabit a great variety of ecological niches, including such arid regions as deserts. Amphibians are found worldwide except in polar regions or high altitudes that are permanently snow covered. A few varieties are found on the sea shore, and some can tolerate brackish swamps. In colder regions amphibians pass the winter by hibernating. Amphibians are cold blooded, relying on the temperature of their surroundings to regulate their body temperatures. They usually have porous skin through which they are able to absorb water and oxygen, some aquatic varieties retain gills into adulthood. Most modern amphibians have four toed hands, and five toed feet (often webbed). Amphibians developed during the early Devonian period and were the first successful land dwelling vertebrates. Early amphibians were large (up to 4m) and covered in bony plates for protection. Originally amphibians were fish-like, similar to the mud skipper of today. Anurans is the proper name for both frogs and toads, the latter being a subset of frogs. Frogs are generally tailless as adults, have compact bodies, and have longer more developed hind limbs than forelimbs. There are approximately 3800 different species of Anurans identified, ranging in adult size from about 1.5cm (3/8") to 40cm (16") snout to vent. Frogs are fascinating creatures due to the incredible diversity of colour, size, reproductive, predation, and survival strategies they employ. The true toads are characterized by warty skin, large eyes with horizontal pupils, unwebbed front hands, large paratoid glands near the ear and bony ridges on the head. All toads skin contain toxic substances that make them unpalatable to most predators. Most toads are nocturnal, and tend to burrow or hide by day. Range: Cane Toads are native to central America. Early in this century in an effort to use them as a biological control agent against beetles infesting sugar cane crops, they were widely exported. Cane toads can now be found in Hawaii, Florida, the Philippines, and most notably Australia. In Australia due to a lack of predators and favourable conditions the cane toad has become prolific, and has entered the culture, as well as the environment, in various fashion as chronicled in the classic documentary Cane Toads: An Unnatural History. Morphology: Cane Toads can grow up to 24 cm (9.5") and weigh up to 1.8 kg (4lbs) for a large female, males are smaller. Like most toads, canes are quite plump when well fed. Distinguishing features are flatter heads and bodies than most toads, uniform brown colour with occasional cream spots or speckles with creamish coloured underside. Cane toads have very large dark eyes and large triangular paratoid glands. Canes toads produce powerful toxins concentrated in their paratoid glands. 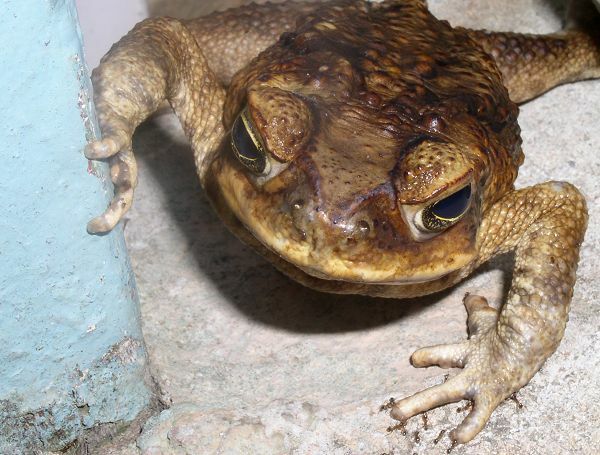 Under extreme stress (such as when being eaten) cane toads can release enough toxin to quickly kill a large dog. The milky white sticky fluid is believed to be psychotropic, but reports of the effects tend to be garbled. Glands on the toad's back can eject the toxin quite some distance, and temporary blindness as a result has been reported. If handling with tongs safety glasses are recommended. Habitat: Diverse, generally found in temperate to sub-tropical forested areas near a water source (where breeding takes place). Highly adaptable to all but extremely cold conditions, cane toads can flourish from arid to tropical rain forest habitats. Behaviour and Diet: Cane toads are nocturnal, sleeping and concealing themselves by day. Cane toads will eat virtually anything they can catch and fit in their mouths. They are voracious feeders, using persistence, energy, and surprising turns of speed to capture their prey. Longevity: Known to live up to 40 years in captivity. Life span in the wild generally much shorter due to heavy predation in native habitats. Ecology: In Central America, although not yet considered endangered, the rapid decline of suitable habitat due to human encroachment, development and pollution is causing decline in wild numbers. In introduced regions tend to be prolific and stable. In Australia the cane toad poses a considerable threat to native wildlife, and is poised to attack the vast wetlands of Kakadu in the very near future. Adapted from an article by James Barker. This article is also available at the Burke Shire Council site. It was announced in August 2002 that the Australian CSIRO is developing a gene which will prevent tadpoles from turning into toads. In order to reduce the population in areas of toad infestation, a torch, a bucket and a set of tongs will enable one to collect as many as necessary. Fill the bucket with water and put a lid on it. The toads will drown. Not very humane, but fast and very effective if done on a regular basis. Another method of disposing of cane toads is pop them into a plastic bag and put them in the freezer. No pain. <Beware! The toad can squirt toxin from the paratoid glands on its back quite some distance. If it gets in your eye, the effect is most unpleasant and you will require medical attention. It will not usually release the toxin unless roughly handled. Cane Toads and Green Tree Frogs. A woman told me that her father put a green frog in amongst a group of toads in order to disprove the claim that toads kill frogs. She said he was horrified to witness them immediately tear the frog apart. However, I recently saw a toad trapped in a birdbath with a smaller green frog. A couple of days later the toad had drowned, but I can't say whether the frog was outside the birdbath or inside the toad. The canetoad is toxic in all stages of life and has very few natural predators in Australia. As a single female can lay 20,000 eggs or more per season, this poses something of a problem for the Australian environment. Pets, birds, snakes and many other species are killed by the toxin. Kites, crows and some other birds have learned how to eat the toads without exposing themselves to the toxin, and apparently the Keelback or Freshwater snake is immune and can swallow toads without ill effect. In Dec 2004 I saw a very sleek mature crow catch a 3in long canetoad, flip it over and peck it, then fly off with it still wriggling. ABC News reported in Dec 04 that Dahl's Frog (sp?) found in billabongs south of Darwin is cannibalistic and feasts on canetoads. Years ago it was quite common for Australians to keep cane toads as pets, as is well documented in the extraordinary documentary Canetoads: An Unnatural History. A curator of the Queensland Museum had a 4kg toad named Betty.